Leslie James Gardner was born in Hendon on 29th December 1907. Awarded a scholarship Gardner attended Westminster School of Art where he was taught by future HonRDI, E. McKnight Kauffer. Apprenticed to Cartiers of Bond Street from 1923 Gardner worked for them until 1929 and then spent most of the 1930s travelling abroad. On his return Gardner worked for Carlton Studios, a leading London-based commercial design consultancy. Based on an exhibition he designed for Shell-Mex Gardner published How They Fly (1939), using pictures and diagrams he explained how flying had evolved. On the outbreak of the Second World War he was appointed Chief Deception Officer, Army Camouflage. His invention of a phantom army of inflatable tanks, aircraft and ships fooled the Germans into thinking that Britain’s resources were vaster than they were. After the war Gardner regularly co-ordinated the Ideal Home exhibitions but his first big job was as Chief Designer for the ‘Britain Can Make It’ in 1946. As well as directing the work of all the designers and architects involved in the exhibition Gardner was involved in the design of a number of the sections, including a revolving stage that rose twenty-five feet into the air for the Women’s Dress Section. The following year the Council of Industrial Design (COID) commissioned Gardner, working once again with the architect Basil Spence RDI, to design the ‘Enterprise Scotland’ exhibition in Edinburgh. Gardner joined the Royal Designers for Industry (RDI) on an official visit to the exhibition. He exhibited at the 1948 ‘Design at Work’ exhibition organized by the Royal Society of Arts (RSA) and the Faculty of RDIs. Gardner co-ordinated the design for the Battersea Pleasure Gardens for the Festival of Britain in 1951, and served on the Festival Design Panel. A number of other important commissions followed. For the British government pavilion for the 1958 Brussels World Fair and the British contribution to the 1967 Montreal World Fair Gardner said he wanted ‘to offer quirky reinterpretations of people’s expectations’. His ability to explain things through the medium of exhibitions meant that he was sought out to design a number of museums including the Pilkington Glass Museum (1965), Evoluon Museum for Phillips in Eindhoven (1966), two displays for the Geological Museum in the 1970s, the Museum of the Diaspora, Tel Aviv (1978), the Museum of Natural Science, Taiwan (1988) and the Museum of Tolerance, Los Angeles (1993). The public decorations for the Coronation of Queen Elizabeth II in 1953 were designed by Gardner and thirteen years later he was appointed to design the superstructure and interior for the QE2. His dioramas for the Commonwealth Institute featured murals he commissioned from Barbara Jones and others. Gardner regarded his appointment as a Royal Designer for Industry (RDI) in 1947 as ‘a significant honour’. He joined other RDIs the following year on a trip to Sweden to see an exhibition arranged to mark the centenary of the Slojd Foreningen School, and in 1952 he joined RDIs Ashley Havinden and Gordon Russell on a visit to the Deutscher Werkbund. In 1985 Gardner accepted an invitation to speak about his career, design philosophy and approach to work for the RDI Annual Address. He contributed regular book and exhibition reviews to the RSA Journal and an illustration for the cover of the July 1994 issue. Generally known as ‘G’ to his fellow designers Gardner published his autobiography, Elephants in the Attic, in 1983 and followed it up ten years later with James Gardner, the ARTful Designer: Ideas off the Drawing Board. In 1987 the Royal College of Arts made him a Senior Fellow and two years later he was presented with the Chartered Society of Designers Medal for outstanding achievement in industrial design. Hugh Casson RDI considered Gardner as ‘perhaps the most inventive, versatile and prolific designer in the UK for more than half of the 20th century’. Kenneth Grange RDI described Gardner, in an obituary for the RSA Journal, ‘as one of our stars’ but, he added, ‘his modesty extended to not wasting time attending meetings’. James Gardner died on 25th March 1997 at the age of 87. To view and search the catalogue online, please visit our digital document library. 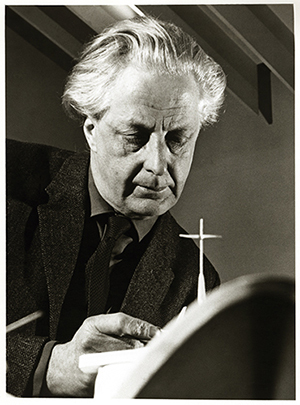 To learn more about the work of James Gardner, his relationships with other designers, and further resources, visit the Exploring British Design prototype web portal.